Garlic’s healing powers are renowned and it is one of the oldest cultivated plants in the world. Did you know that garlic is over 5,000 years old? It has been revered by the ancient Egyptians, Israelites and Chinese. Modern science agrees that garlic has many health benefits and there is much research to support this. While garlic may not always keep the vampires away or ward off evil, it will certainly transform any meal into a tantalizing, bold, aromatic and healthy culinary experience. Fresh garlic is available in your produce market all year long. Garlic is arranged in a head, called the “bulb,” which is about 2 inches in height and diameter. This bulb has a number of small, separate cloves and each one is encased in a paper-like skin. The taste of garlic is unique and is pungent with a hint of sweetness. When you are cooking with garlic, remember to chop or crush the cloves just before cooking. This stimulates the process that converts the powerful phytonutrient “alliin” into “allicin” which is attributed to many of garlic’s health benefits. Once you have chopped the garlic and it’s ready for cooking, wait a few minutes before adding it to your dish. This will produce more allicin in the garlic. Garlic is an excellent source of vitamin B6, vitamin C, and copper. These are important nutrients for maintaining a healthy immune system. Garlic is beneficial for helping to lower blood pressure and even heal athlete’s foot. Garlic like onions, shallots, chives and leeks belong to the “alium” family. Also known as the “stinking rose”, garlic has been used to treat everything from cancer and heart disease to athlete’s foot and the common cold. Look for garlic that is plump and has unbroken skin. Gently squeeze the garlic bulb between your fingers to check that it feels firm and is not damp or soft. Avoid garlic that is shriveled, has any hint of mold or garlic that has begun to sprout. The size of a head of garlic is not an indication of quality. If your recipe calls for a large amount of garlic, remember that it is always easier to peel and chop a few larger cloves than many smaller ones. Store fresh garlic in an uncovered or a loosely covered container in a cool, dark place away from exposure to heat and sunlight. This will help maintain its maximum freshness and help prevent sprouting. Whole garlic bulbs will keep fresh from two to three weeks. 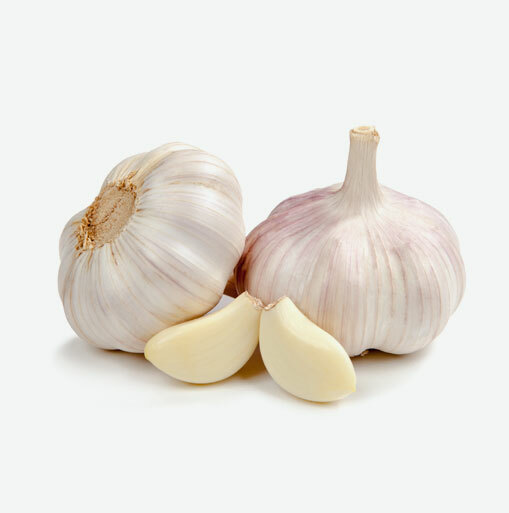 Check the garlic bulbs regularly and remove any cloves that look dried out or moldy. If you are feeling adventurous, try marinating pressed garlic in olive oil and use this pungent and tasty oil in dressings and marinades. You might also like to purée a clove of fresh garlic, a can of garbanzo beans (chick peas), add a tablespoon or two of tahini, about 2 tablespoons of extra virgin olive oil and lemon juice. Puree until smooth or to your desired consistency. It makes a nutritious, tasty, quick and easy hummus dip. If you want to include garlic in your veggies, sauté steamed spinach, garlic, extra virgin olive oil and fresh lemon juice. This is delicious as a side dish to any meat. If you enjoy garlic like most do, add it to soups and sauces or you can even purée roasted garlic, cooked potatoes and olive oil together to make delicious garlic mashed potatoes. The possibilities are endless.